Sections can only be in one course at a time. 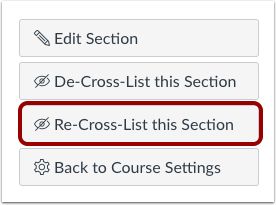 Once a section is cross-listed, you can re-cross-list the section into another course if necessary. Cross-listing a section is a course permission. 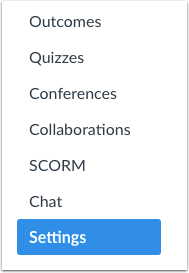 If you are an instructor and cannot view the cross-list options, this feature has been restricted by your institution. If you are an instructor and are allowed to cross-list, you may choose to de-cross-list a section. This option means that you can send the section back to the original course. 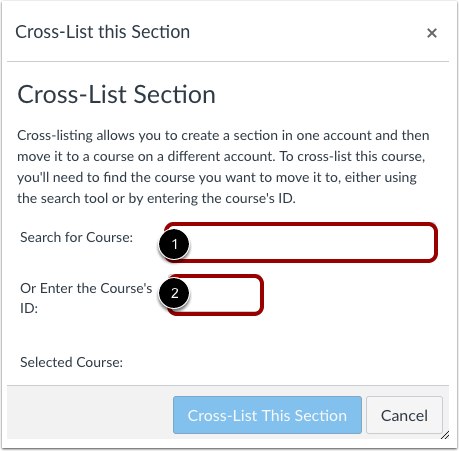 If there is a chance you want to de-cross-list a section, make sure you add yourself to another section in the original course before cross-listing, otherwise you will no longer have access in the original course. 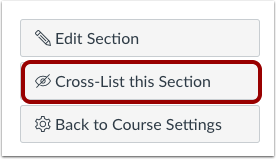 If you have already cross-listed a course that you cannot de-cross-list, contact your Canvas admin. Before you can cross-list a section, the course must contain at least one enrollment. Previous Topic:How do I remove an enrollment from a course section? Next Topic:How do I de-cross-list a section in a course as an instructor? Table of Contents > Courses and Sections > How do I cross-list a section in a course as an instructor?